Strunnikow graduated from the Moscow Film School and became a photojournalist for 'Pravda' in 1932. At that time, he documented the industrialisation and collectivisation process in Middle Asia and the Caucasus. During the war he was a frontline photographer for 'Pravda', and he was noted for his coverage of the battles around Odessa, Moscow and Leningrad. This close-up image of 'Soja', also known as ‘Zoya Kosmodemyanskaya, “Tania”, a Russian partisan tortured by Fascists’, is emotionally disturbing. 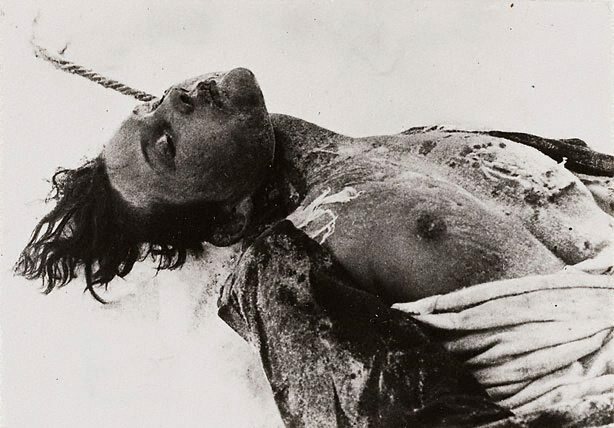 Strunnikov shows us a woman, presumably not long dead, who lies in the snow, her chest bearing the marks of torture and the rope with which she was hung frozen taut around her broken neck. Who was Soja? An innocent victim? A heroic martyr? While Strunnikov denies the viewer the information to contextualise and explain, one can observe in this small, tightly cropped press print, that the body is resurrected, and invested with an order of knowledge that makes ‘Soja’ a compelling icon of remembrance and regret through signifying the real effects of war. Needless to say, the force of politics in the Soviet Union added weight to 'realism' as the preferred form of expression, and to the comprehensive documentation of battles and deaths on Soviet soil. And while the camera as ‘witness’ has been present in wars, as early as the American Civil War, this photograph is a poignant example of how photography has been critical in the construction of how conflict is understood, politically and ideologically. This is a particularly important image as war photography is considered in some quarters to be one of the few true genres of the medium.